We also offer after hours appointments upon request. Parking available at rear of building on Drane Street. If you want to take back your ability to show off your biggest smile and improve the aesthetics of your teeth then our range of treatments at Dentures At Clayfield can help. A lot can happen to our teeth during our lives and if yours have become a source of discomfort, then you could benefit from our range of treatments here at Dentures At Clayfield. Something that we always advocated for and believe strongly in, is the right of every single person to be able to burst into a smile without having to worry about missing or damaged teeth. Over the course of time our teeth can become stained, broken, cracked and decayed and in some cases may cost a small fortune in order to properly restore. Dentures are a simple and effective way to almost immediately improve the appearance of your smile. From our recently upgraded practice in the north of Brisbane, we are able to give you a reason to flash your smile whenever the mood takes you and with the knowledge that your teeth look great. Here at Dentures At Clayfield, we use the latest in dental technologies and high-quality materials to create custom-fitted dentures that are as comfortable as they are functional. By using our very own onsite laboratory we can ensure that we source and control the quality of the necessary materials and provide you with dentures that have a natural look that blends in seamlessly with your smile. Maybe you only need a small area of coverage or perhaps you require a full set—whatever the degree to which you would like to make improvements, we can tailor a treatment that is unique to your situation. Dentures are essentially a set of custom-made and custom-fitted false teeth that are able to replicate both the function and appearance of missing or damaged teeth. This means that we can treat you for one or multiple missing teeth with dentures that are designed to substitute your teeth in more ways than one. Dentures have been a very popular cosmetic solution to missing teeth over the years and with our ability to create prosthetics that closely mimic the aesthetics of your natural teeth, they have never been more effective. Our excellent craftsmanship, dedication to quality and meticulous attention to detail during every stage of the manufacturing process, creates a superior denture for our patients. We will take the time to understand exactly what it is that you would like to achieve with your dentures and are patient and compassionate in all of our patient relationships. So how do you know which dentures to choose? Dentures are classed as either full dentures or partial dentures depending on the amount of work required, but there is only one major difference between the two. Partial dentures are created by making impressions and moulds of the teeth that you have left, your gums and your jaw. These are made using precise measurements of the distances between your jaws and the gaps left by your missing teeth, thus allowing us to cast your dentures right down to the smallest degree. As mentioned, the fact that we create them here at the practice means that you will get them more quickly and we can have your dentures ready to go in a couple of weeks. Partial dentures use your remaining teeth to act as a support structure as they are fastened into the gaps of your missing tooth or teeth to restore your ability to smile freely. A set of full or complete dentures has always been an ideal tooth replacement option and we design them for patients who are needing to replace all of their teeth as opposed to just one or a few. Full dentures have a natural-looking gum-coloured acrylic base plate that provides the same support as the remaining teeth in a partial denture. It fits perfectly over your gums and is designed to offer maximum retention. For a full denture procedure, it may take 4-5 appointments to develop and to take the necessary measurements but once we have everything we need the process is concluded relatively quickly. Dentures are able to replace either all or a few of your teeth and there are two kinds of dentures available, complete dentures (a full set) or partial dentures. Complete dentures are the dentures that substitute your natural teeth altogether. Dentures are fitted over the gums that surround your jawbones and if you want to improve their stability you can get them affixed to dental implants. However, partial dentures that replace some teeth are attached to the specific teeth they are replacing but like complete dentures also rest on the gums and will cover the area where your natural teeth and bone are absent. Can I sleep in my dentures? You can wear your dentures when you sleep but it is recommended that you remove them before you do. One of the reasons for this is to allow your gums and bone to rest and release the tension built up from having your dentures in all day. If it is necessary for you to wear dentures for appearance’s sake or other reasons then you should find time every day to take your dentures out for a little while, and properly clean them. It is just as important to practice good oral hygiene as it is to clean your prostheses. 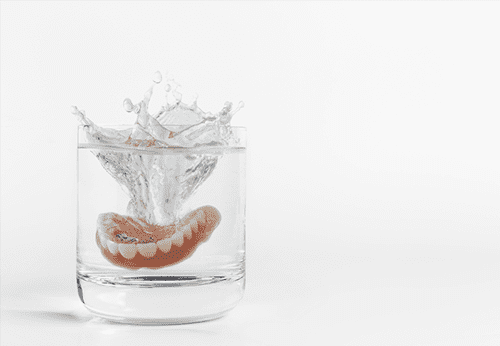 You should clean and store your dentures in water before you sleep. Can I eat normally with dentures? When you first get dentures there is usually a small adjustment period for patients to get used to them. This period is relatively short and you should be able to chew normally soon after; however, hard and sticky foods may take more time to adjust to. A trick used by many patients is to apply a small quantity of denture adhesive to their dentures to more securely attach them, and aid the transition of re-learning how to eat. One thing that we urge all of our patients with dentures to avoid is chewing gum wherever possible because it often damages dentures. To find out more about our dentures, or to make an appointment, please click here. Fill out the form below to request an appointment. One of our team members will be in contact with you shortly. Please fill in the online enquiry form to ask a question or book your consultation. The friendly team at Dentures at Clayfield look forward to seeing you in our practice soon! Click on the blog article below for more news and information from the team at Dentures at Clayfield. Parking is available at the back of the building on Drain Street. We can come to you by appointment.